my predecessors – or successors, come to that – had the same problem! But then sport has always played such an important part in my life. I always knew I wanted a career in sport, but never imagined I would ever get paid to travel around the world and watch it at the highest level. 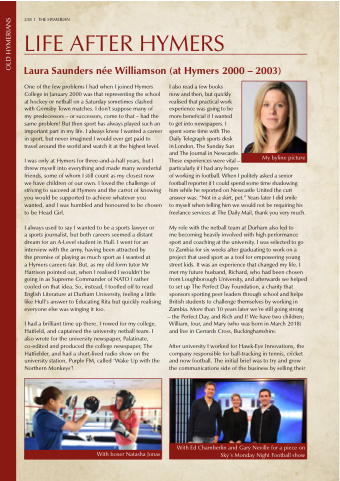 I was only at Hymers for three-and-a-half years, but I threw myself into everything and made many wonderful friends, some of whom I still count as my closest now we have children of our own. I loved the challenge of striving to succeed at Hymers and the carrot of knowing you would be supported to achieve whatever you wanted, and I was humbled and honoured to be chosen to be Head Girl. a Hymers careers fair. But, as my old form tutor Mr Harrison pointed out, when I realised I wouldn’t be going in as Supreme Commander of NATO I rather cooled on that idea. So, instead, I tootled off to read English Literature at Durham University, feeling a little like Hull’s answer to Educating Rita but quickly realising everyone else was winging it too. I had a brilliant time up there. I rowed for my college, Hatfield, and captained the university netball team. I also wrote for the university newspaper, Palatinate, co-edited and produced the college newspaper, The Hatfielder, and had a short-lived radio show on the university station, Purple FM, called ‘Wake Up with the Northern Monkeys’! in London, The Sunday Sun and The Journal in Newcastle. to myself when telling him we would not be requiring his freelance services at The Daily Mail, thank you very much. – the Perfect Day, and Rich and I! We have two children; William, four, and Mary (who was born in March 2018) and live in Gerrards Cross, Buckinghamshire.